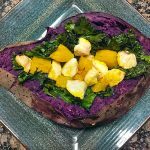 Eat the rainbow, and that includes all the different colors of yams! Purple sweet potatoes. They are just as gorgeous as they sound. I found some at my local grocery store and bought them in a second. I schemed for quite a while on how I would use mine, and finally landed on stuffing them. Tahini sweet potatoes was the outcome! 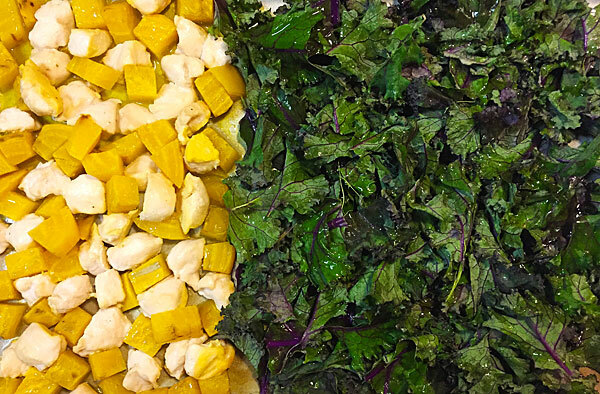 I chose golden beets and chicken, along with some kale. Perhaps a huge part of this was considering all the colors together (I do admit that freely) but the taste combos worked wonderfully still. I topped these stuffed sweet potatoes off with a semi-sweet garlic tahini sauce. Fan of #stuffedsweetpotatoes? You can #eatmorecolor with these vibrant purple ones! Stab the potatoes and then wrap them in foil. Place in the oven at 400F and bake for about 45 minutes. When this is more than halfway cooked through you can start with the rest of the meal. Peel the beet and then cube it up along with the chicken. Place in a baking pan, drizzle with some coconut oil and bake for about 15 minutes. Next add the kale. Push the meat and root vegetable to one side so you can use the same pan. Lightly toss the kale in some coconut oil too and then continue to bake everything for another 10 minutes. Remove everything from the oven and get to stuffing! 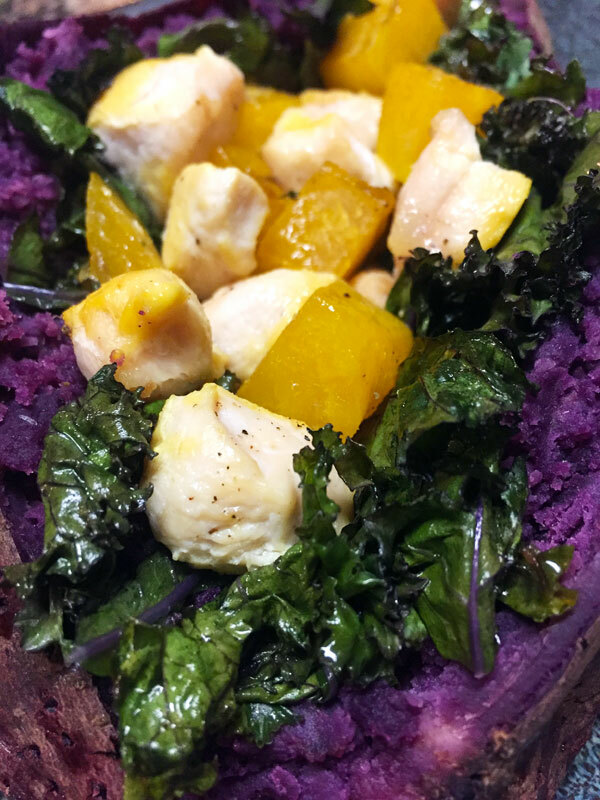 I sliced the sweet potatoes down the center and filled them with kale, then topped with the chicken and beets. Sprinkle lightly with some pepper and sea salt. Now all you need is the sauce! The tahini I used was from a local store but next time I am buying this one! It’s full of vitamins and sounds like it has the best flavor. Win win! To finish everything off I made a simple tahini sauce. If you don’t know what this is, it is blended sesame seeds. The kind I used was a roasted garlic tahini. It can be a weird flavor on it’s own and very thick so combine with a little water and add a little to it to change it how you like. For this one I added about half the amount of water to the paste and then a dash of agave to lightly sweeten. Mix well and then drizzle over the stuffed sweet potatoes! 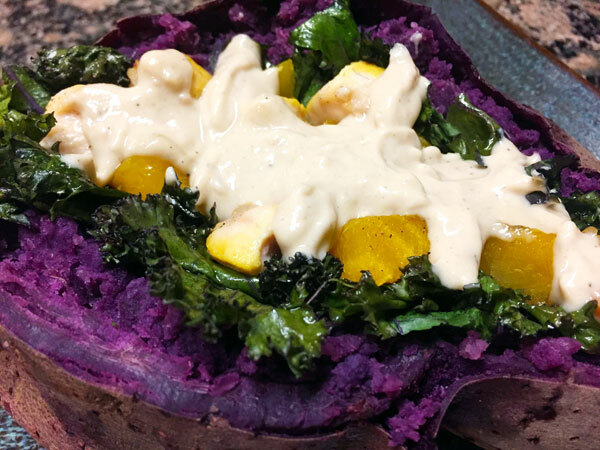 Purple sweet potato stuffed with kale, golden beets and chicken with a lemon tahini drizzle. Start by peeling the beet and then cubing it up along with the chicken. 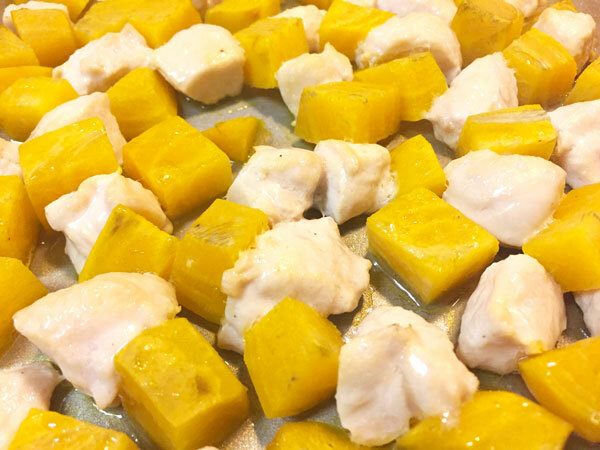 Place in a baking pan, drizzle with some coconut oil and bake for about 15 minutes. Lightly toss the kale in some coconut oil too and then continue to bake everything for another 10 minutes. Remove everything from the oven and slice the sweet potatoes down the center. Fill them with kale, then top with the chicken and beets. Sprinkle lightly with some pepper and sea salt. Mix some tahini (roasted garlic flavor recommended) with water and a little agave. Drizzle over the stuffed sweet potatoes. 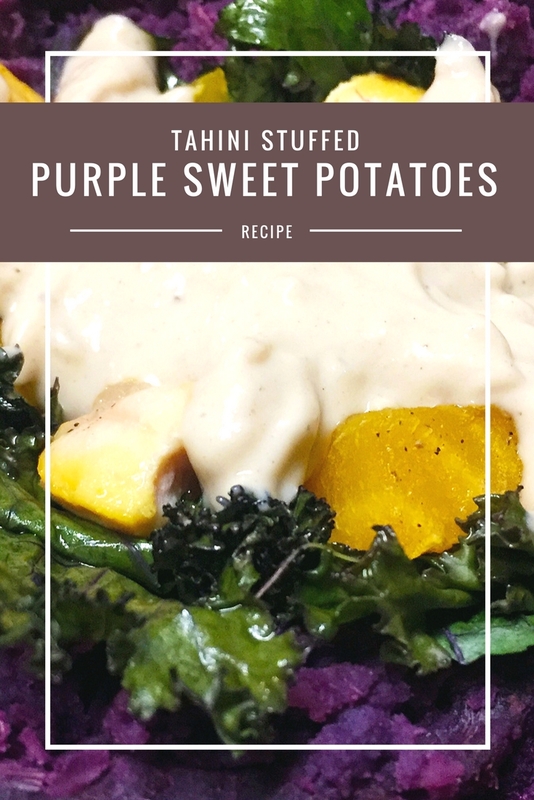 Just like most of my meals, you can easily turn these stuffed tahini sweet potatoes in to food prep for the week! Did you know that you may actually not be eating a sweet potato? Or a yam? I had no idea what the difference was, which is embarrassing to admit as a food blogger. I am not very fond of russet potatoes or red potatoes, but when I found ‘sweet potatoes’ I was sold. Then when I started to find different colors, such as this purple one, I was very intrigued. Turns out, they are not really the same at all. You can read more about it here in this article I found from The Kitchn. I guess I will just make it simple and say that I enjoy many varieties of tuberous root vegetables! 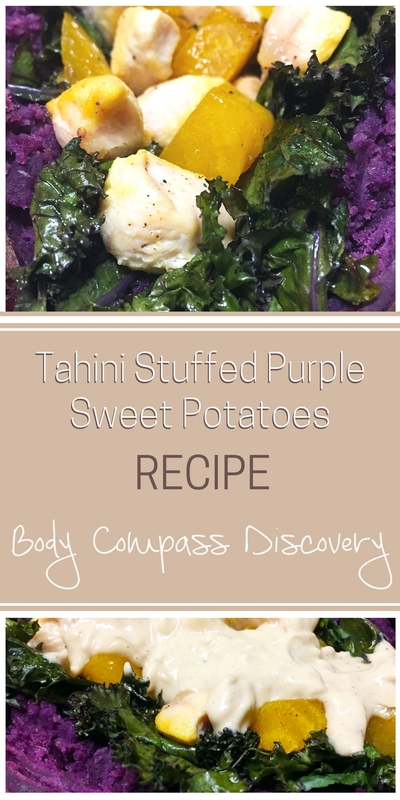 Tahini sweet potatoes stuffed with meat and veggies are simple, delicious and vibrant. 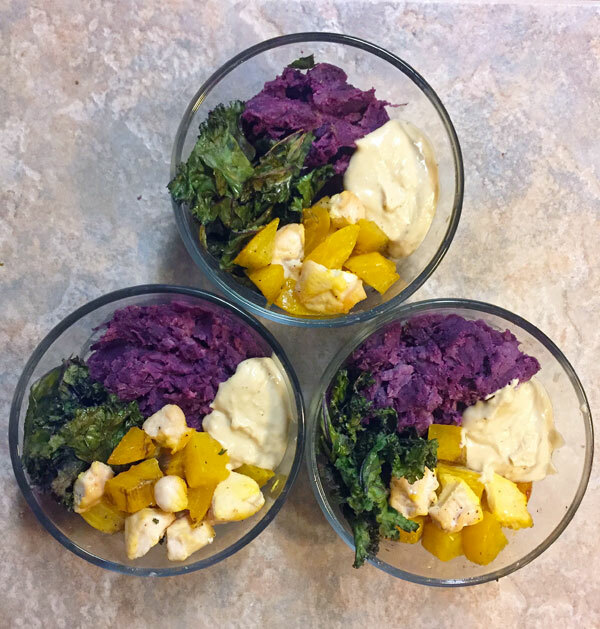 Eat for color and taste with this recipe! This looks delicious. 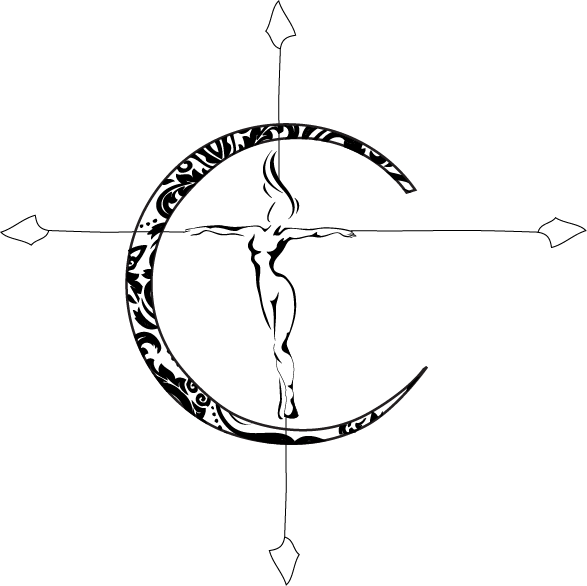 Something really different to enjoy. The varieties of different flavors; sweet and tart sound like a yummy combo.